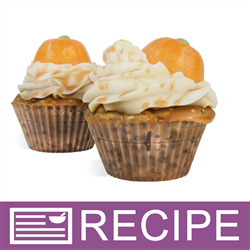 These adorable pumpkin soap cupcakes look and smell good enough to eat. They are made with lots of skin-loving ingredients. This slightly scrubby soap is the perfect addition to your fall body care line. INCI Ingredient Label: Olive Oil, Water, Palm Oil, Palm Kernel Oil, Sodium Hydroxide, Murumuru Butter, Pumpkin Seed Oil, Castor Oil, Fragrance, Pumpkin Flakes, Sorbitol, Coconut Oil, Propylene Glycol, Stearic Acid, Glycerin, Fluorphlogopite, Titanium Dioxide, Tin Dioxide, Iron Oxide, Chromium Oxide Green. methods of working with dangerous chemicals, it is simply a soap recipe for advanced soap makers. To beaker, add 1 oz. MP soap base and melt in microwave. Add green color and mix well. Pour into pumpkin tops and allow soap to harden. To measuring cup, add 3 oz. MP soap base and melt in microwave. Add orange color and mix well. Spray green soap with rubbing alcohol and then pour orange soap into pumpkins. When soap is hard, remove from mold. To polypropylene pitcher, add water and then slowly add lye. Mix well and set aside to cool. To metal pot, add olive oil, palm oil, pumpkin seed oil, castor oil, murumuru butter and palm kernel flakes. Heat on stove top until liquid. Set aside to cool. When both lye solution and oils are 120ºF, slowly pour lye solution into oils. Stick blend until light trace. Pour 20 oz. soap batter into mix and pour funnel pitcher and set aside. medium trace. Pour soap into muffin molds. Stick blend remaining soap batter until thick trace. Move soap to piping bag and pipe onto soap in mold. To beaker, add 1 oz. MP Soap and bronze mica. Mix well and drizzle on top of soap cupcakes. 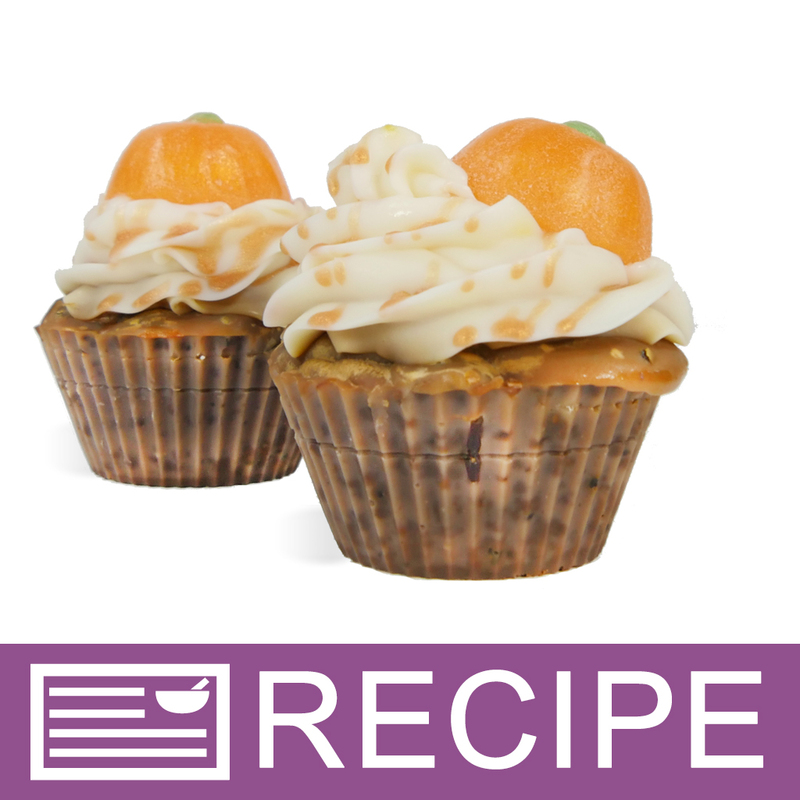 Then, place one pumpkin soap into top of frosting on each cupcake. After at least 24 hours, remove soap from molds. Wrap pumpkins in plastic wrap. Allow to cure for 4-6 weeks.